Fresh, homemade hummus is incredibly easy to make and can save you a ton of money over the store bought brands. This simple recipe is a perfect starting point that can be easily spiced up to your tastes. One of my favorite things to add is chili paste, like Sambal Oelek. In a blender, combine ingredients in order listed. On the lowest speed, blend the ingredients while slowly adding the reserved liquid from the can of garbanzo beans, until the desired consistency is reached. Serve with raw vegetables, pitas, or chips. How do I get the rest off the blades? It’s so yummy and I’m losing too much of it. 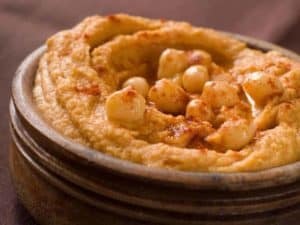 This is a great baseline hummus recipe. I added a jalapeño pepper to mine and it was perfect! I made some of this today and it was very tasty. Great recipe!